The winding Araniko Highway leading to Sindhupalchowk is dotted with rubbles of stones and wooden debris. Some houses that are barely standing have been abandoned for several months. While some people along the once bustling roadside markets have set up shops under new tin sheets, there are still many who have no roof over their head. More than eight months after the devastating earthquakes in April and May, the majority of families in the worst-hit district of Sindhupalchowk, which saw almost half of the total 8,500 deaths, are still living in temporary shelters through the winter. 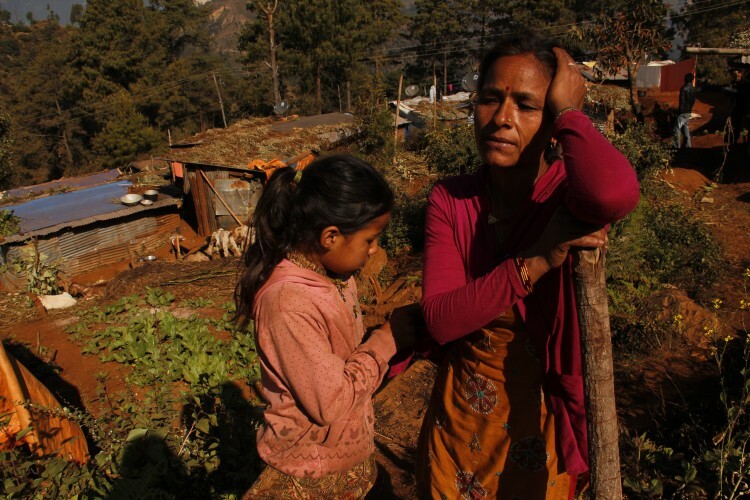 An estimated 70,000 families have lost their homes after the twin quakes of April 25 and May 12 wreaked havoc in Sindhupalchowk. The National Reconstruction Authority (NRA) got its full shape earlier this month and the recently appointed CEO Sushil Gyewali has said that it will take another three months before reconstruction begins in all the affected villages in 14 districts most damaged by the earthquake. “So far we’ve only distributed the initial relief sum of Rs 15,000 and more recently the additional Rs 10,000 for the families to buy warm clothes,” says Bharat Prasad Acharya, administrative officer at the District Administration Office, Sindupalchowk. According to Acharya Rs 790 million rupees has already been disbursed for families living in temporary shelters in Sindhupalchowk to buy warm clothes. “Now that the reconstruction agency has finally been set up, we hope to begin reconstruction work soon,” adds Acharya. He also adds that reports in the media last month about earthquake victims dying of winter cold were wrong. “We sent rapid response team to those villages immediately after those reports surfaced and found that the deceased were suffering from chronic illnesses. It was wrongly reported that they died of cold,” says Acharya. 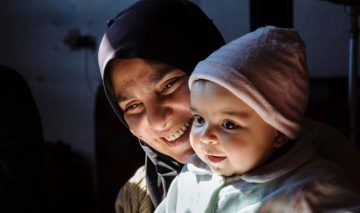 While NRA finally gets started with detailed damage assessment, families in several villages especially in the uplands are forced to brave harsh winter in temporary shelters. Many families in Sindhupalchowk have been compelled to abandon their villages perched on precarious hill sides where earthquake-triggered landslides have remained a constant threat since April 25. Almost an hour’s drive along the dusty trail further north of the district headquarters of Chautara lies Dandagaun of Seuli VDC where almost all mud and stone houses have turned to rubble. Following the earthquake all 19 families of Dandagaun have left the village and are residing in temporary shelters in Sailibhanjyang of the same VDC fearing landslides. “First the earthquake destroyed our homes and then the landslides buried our fields and roads. We came here to protect our lives,” says 40 year old Saraswati Chuhan. Her two-story stone house had only been completed in March. “The house we built with all our savings, almost Rs 100,000, collapsed in front of our eyes. Thank god we survived,” she says. Her family of six has been making ends meet with the sole income of her husband, who works as daily wage laborer in Chautara. The Chuhan family’s new “house”, a temporary shelter covered with tin sheet, has two beds, a table and cooking stove right next to the entrance. While they were able to retrieve some clothing items, utensils and citizenship certificates, they couldn’t bring their cattle along. The roads along the hills were either closed or too narrow for animals to pass. Frequent landslides have now destroyed the water source in Dandagaun. 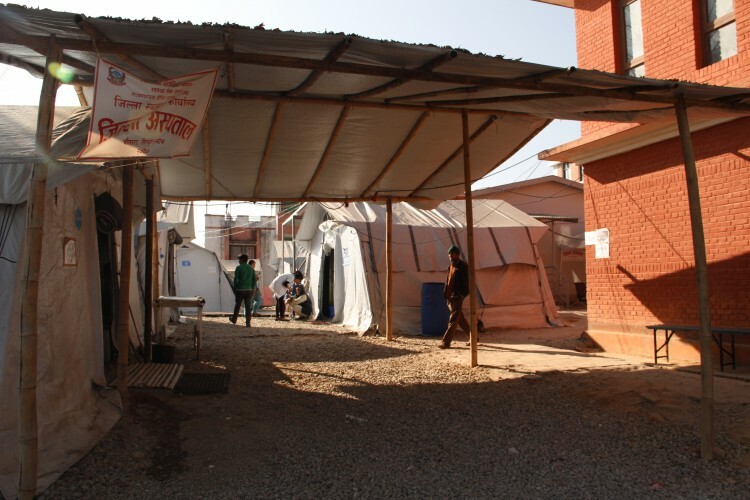 The district hospital in Chautara (pictured below) was severely damaged by the earthquake, forcing the hospital to carry out its services from temporary structures. With the help of Red Cross Norway, the hospital provided services from the modular white tents set up in the sprawling Tudikhel grounds just around a hundred meters from the dilapidated hospital building. After operating from Tudikhel for more than four months, the tents have moved back to the premises of the decrepit district hospital compound. Some of the tents house patients while others have physiotherapy wards. A recently built prefab building next to these tents runs OPD, emergency and obstetrics services. While patient flow has decreased in comparison to the aftermath of the earthquake, running a hospital from tents with just one lab, limited resources and staff makes it seem like running a mobile medical camp, the doctors in Chautara complain. They say it’s getting difficult to provide services expected of a district hospital. “Patients’ health itself is at risk when they sleep under these tents. Furthermore patients will be at risk of infections if the waste isn’t disposed of properly. But we don’t really have any choice until new buildings are constructed,” says Roshan Bhagat, a doctor at the hospital.